Globally, many automobile markets are witnessing a steep demand growth for Electric Vehicles on the back of lowering technology costs, supportive governmental policies and stringent emission regulations. Indian market is in the initial stages of electric mobility evolution and is expected to witness higher penetration in future supported by the declared intent and supportive actions of the Indian government. 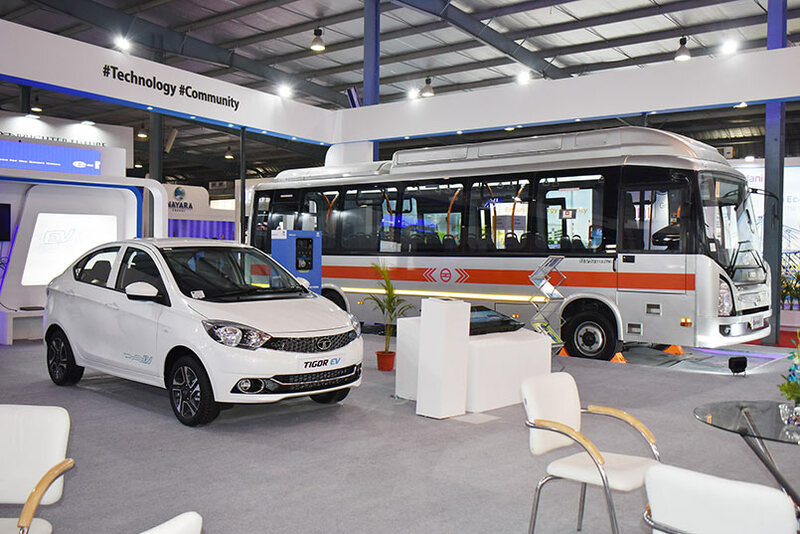 The Tata Tigor EV and the Tata 9m Ultra Electric Bus displayed at the Tata Pavilion in Vibrant Gujarat 2019. In June 2018, Tata Motors set up a separate electric mobility business vertical, and appointed Mr. Shailesh Chandra to lead the same. Tata Motors is playing a lead role in proactively driving the electric mobility in the country. To build a sustainable future for India, the company has been working collaboratively on various electric and hybrid vehicle solutions in the commercial vehicle space and is simultaneously working on electrification in the passenger vehicle front. TIGOR EV, which is a full electric, zero emission compact sedan marks the beginning of Tata Motor’s journey to boost e-mobility and offer a full range of electric vehicles to Indian consumers, reaffirming our commitment towards zero emission solutions. Designed and developed by Tata Motors, the Tata Ultra 9 Meter Electric Bus is the first full electric drivetrain. With zero-emission and noiseless operations, the Ultra Electric Bus fills the need for cleaner public transport vehicle. It is a modern state-of-the-art solution for Urban Transport requirements.